Usually I try to work the way I dont need to take too much care of my lathe runout, but its a good idea to have some reference values. Here are some simple measurents I take. 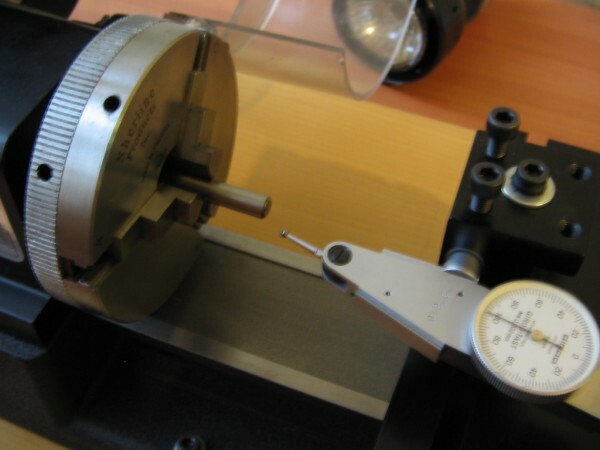 I use a swiss 0.002 mm test indicator and some grounded steel rods. 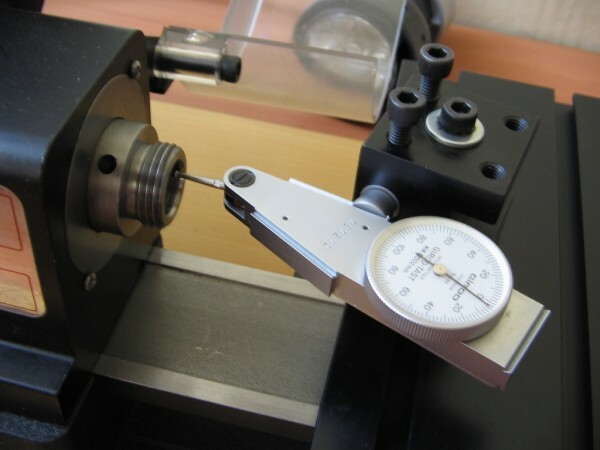 Spindle internal tapper: 0.006 mm. 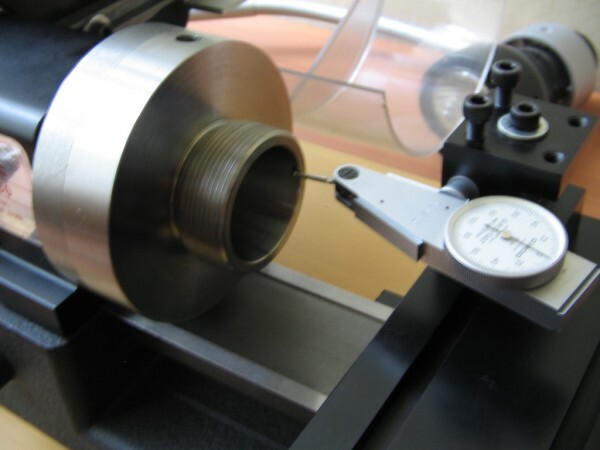 Sherline specs states 0.0005″ (0,0127 mm) , so its ok.
Spindle play 0.005 mm. Again within sherline specs: 0.0002″ (0,0054 mm). 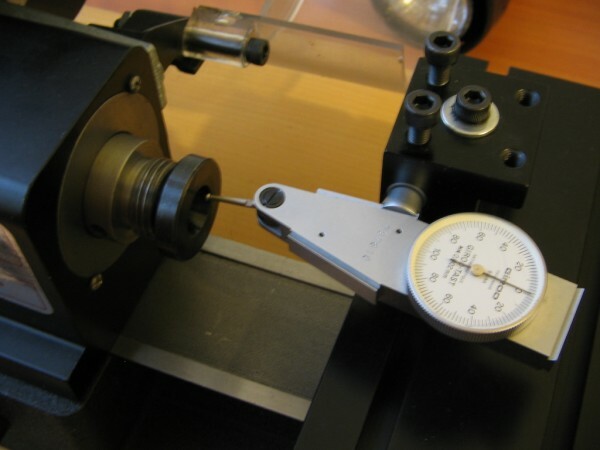 Spindle face: 0.014 mm. This suprise me as spindle face its the reference surface for chucks. There’s no spec for this, buts seems to much to me. 2.5″ 3 jaw chuck: 0.094 mm. 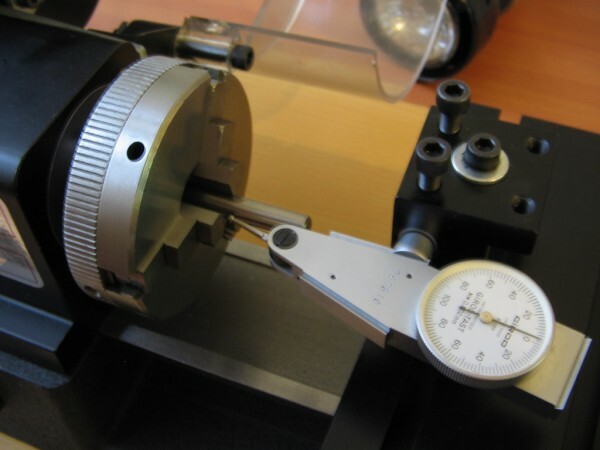 Sherline states a max of 0.003″ (0,076 mm) runout, so its a bit out of specs. 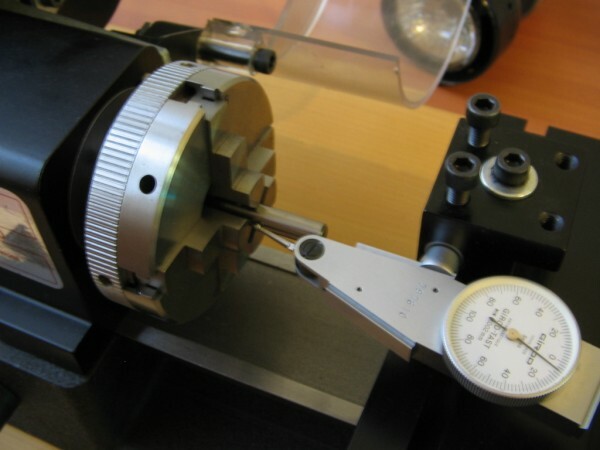 Another 2.5″ 3 jaw chuck: 0.124 mm. I buy it used and seems it has a lot of use, but don’t think this explain this value. 2.5″4 jaw chuck: 0.080 mm. Almost within specs (buy used but in good condition). 3.1″ 3 jaw chuck: 0.024 mm. Better. This is was also buy used. This was a surprise as visually jaws doesn’t look to met “perfectly” when closed. WW adaptor: 0.006 mm. Seems this doesn’t add noticable runout. WW 3/16 collet: 0.024 mm. This is a lot for this type, but to be fair may be I ruin this (never used) collet as I tight without the steel rod (of course this should never be done). Ups. Maybe should I order a new one. 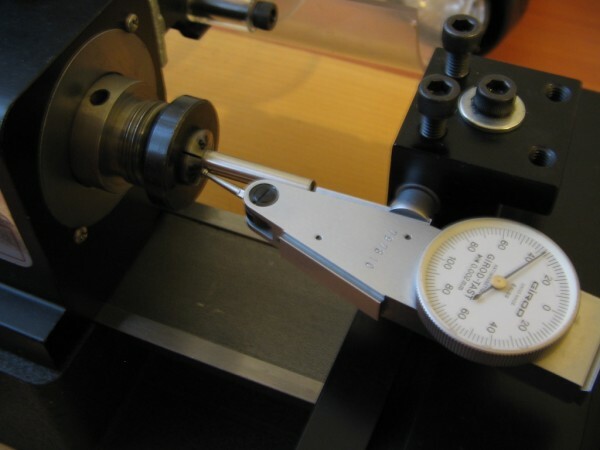 WW 0.25″ collet: 0.014 mm. This time no mistake was made. 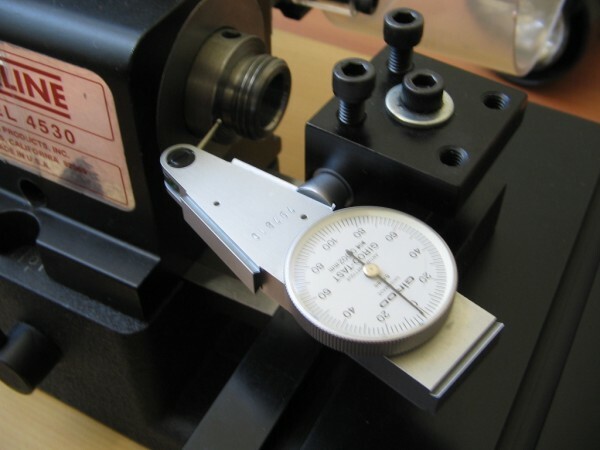 I read somewhere that no more than 0.0005″ (0,0127 mm) is ok for this collets. Chinese ER16 chuck: 0.040 mm, at 40 mm from spindle nose. That’s a lot; don’t now if its due to poor quality or larger distance from nose. I must say this cheap chuck looks well made, but I did correct back thread as this was so oviously deviated. 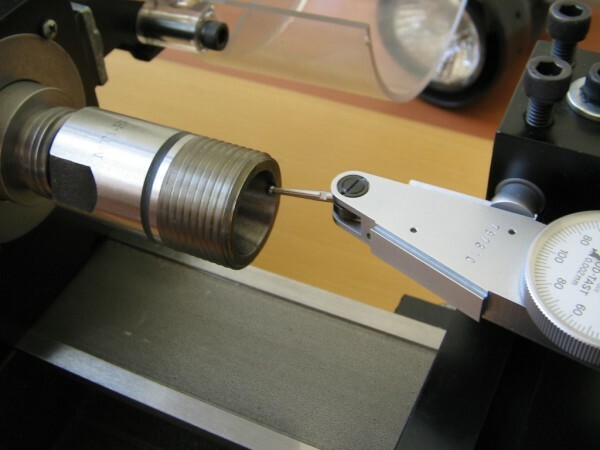 Threaded ER16 chuck: 0.006 mm. I buy this from a guy on ebay, not chinese, and must re-bore internal cone and front thread to make it usable, so this explain this good reading. ER32 chuck: 0.016 mm. Accounting the spindle face “runout”, cost (around$50), the fact this is mounted in a faceplate and still don’t get the bolts, this doesn’t seem to be a bad value (will take another reading when buy the bolts). 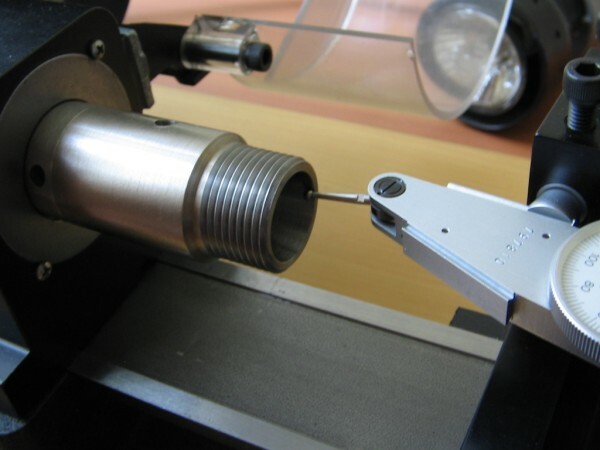 ER32 threaded chuck (“Beal Tool”): 0.006 mm. Sell as pencil chuck for the taig lathe; I did must face the back (final adjustment was carefully made using sand paper). Its seems a good value, but as I remember there’s a small amount of axial deviation (don’t save those readings). 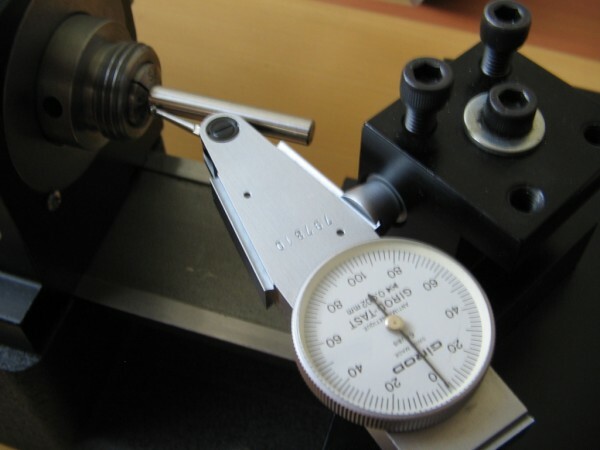 6 mm milling collet: 0.016, 0.030 and 0.070 mm at 3, 13 and 23 mm from spindle nose. 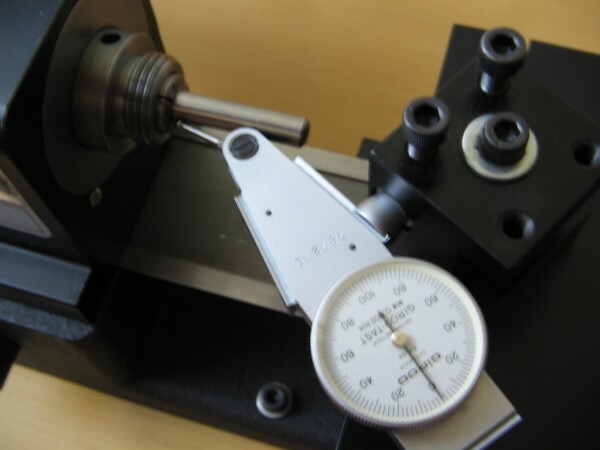 3/16 mm milling collet: 0.006, 0.004 and 0.010 mm at 3, 13 and 23 mm from spindle nose. I buy ER chucks and collets looking for precision and avoiding marks on work. Now its doesn’t seem a great deal (collets add more runout). Nevertheless ER16 chucks are handy for the mill. And ER32 chucks can work great as vertical fixtures. Jaw chucks seems to have too much runout. Measuring first chuck face runout on border gives me 0.032 mm, so may be I need to re-face spindle (I would lost ER16 threaded chuck precision tough). 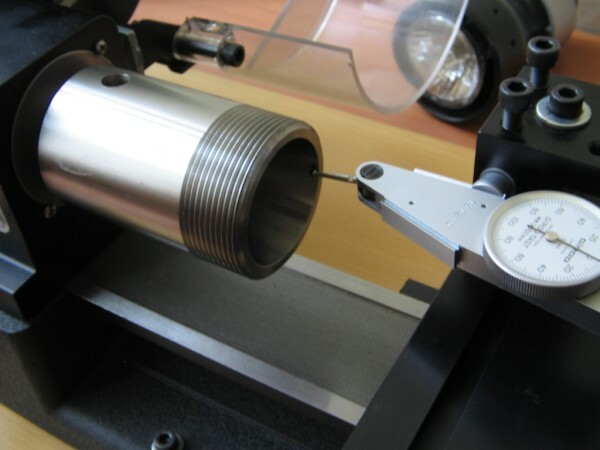 I would like to buy precision pin gages to be able to measure ER and WW collets (and to take better measurements). 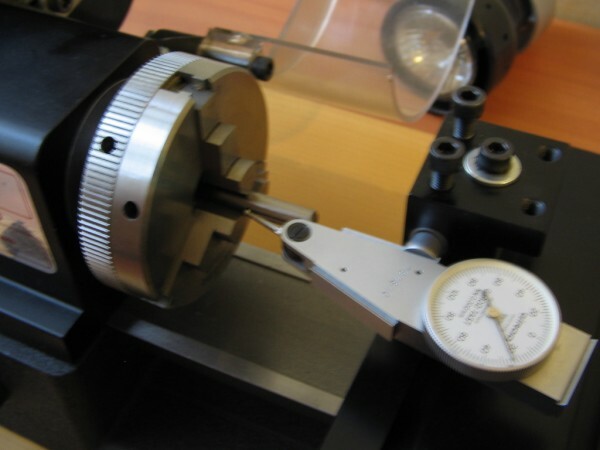 Anyway, how much runout is acceptable depends on your particular needs, and for killing precision a independent jaw chuck or a special-purpose-on-spindle-turned fixture should be the way. Update: I re-face spinle nose and now face runout is less than 0.004 mm, and first chuck runout drop from 0,076 mm to 0.054 mm and second drop from 0.124 mm to 0.104 mm. Due to some chatter issues I take around 0.1 mm, but sure can be less if well done. I forgot to check spindle align, but it’s better do it before re-face (may be turning a test rod and measuring both sides).